There are so many reasons and explanations out there for your marriage to not work. Looking at statistics can be depressing when you realize that marriage is an uphill battle. But taking this best marriage advice and applying it to your marriage will give you the best chance at a successful marriage! 📑 To download these marriage tips as a PDF to save and/or give as a wedding gift CLICK HERE. If you’re newly married you’ll quickly learn how life likes to push it’s way to the top spot of your priorities. If you’ve been married- you’re well aware. Making your marriage a priority is something that you need to choose to do. Some days will be easier than others. But it must be an intentional choice. If you want to know how to stay married this is your number one tip. I’m sure you’ve heard the saying while looking up marriage problems advice “marriage is 50/50”. But that leaves room for quitting. A lot of couples will measure their effort and if it’s not being reciprocated then they dial their own effort down. But if you are determined to give 100 percent at all times you’re not worried about your spouse and what they are or aren’t doing. A book that helped me learn this was The Excellent Wife by Martha Peace. I read this book when I was first married and have read it every year since. It has so much valuable information in it on being a biblical wife, I learn and apply something new every year. Marriage isn’t just about what our spouse can do for us, it’s also what we can do for them. As the years’ pass, sometimes one has to put in more effort than the other and then vice versa. And that’s ok, you chose to be partners for life. Don’t talk about your marital problems if you’re just going to say everything your spouse is doing wrong. But the people you tell will be left with a negative impression of your spouse. And when they bring it up a year later as if it’s still a huge deal and hump in your marriage you won’t even know what they’re talking about. This is especially true with your parents. Sometimes it’s easy to unload all the bad and forget about the good. But if you were only hearing about the bad that your daughter’s husband was doing- what kind of impression would you have of him? You’d most likely not like him, or think that behind closed doors he’s a horrible husband. Truth is- no marriage is perfect, every couple disagrees and has rough patches. The point is to get up and move on. But it’s hard to move on when you’ve spewed out words that you can’t take back to the people outside of your marriage. In this day and age, most of our generation have a skewed view of marriage. We have no clue what we’re supposed to do or how we’re supposed to do it. Most of us grew up in a broken home with no picture of marriage. So to enter marriage thinking that you’ll have the romance you’ve seen on TV is sometimes unrealistic. Especially if your spouse, like mine- never watched those movies or saw those examples. There is nothing wrong with growing in wisdom in your marriage. This is one of the main rules for a successful marriage. Even if you’re not having problems, marriage counseling can always be beneficial. And there are always books. 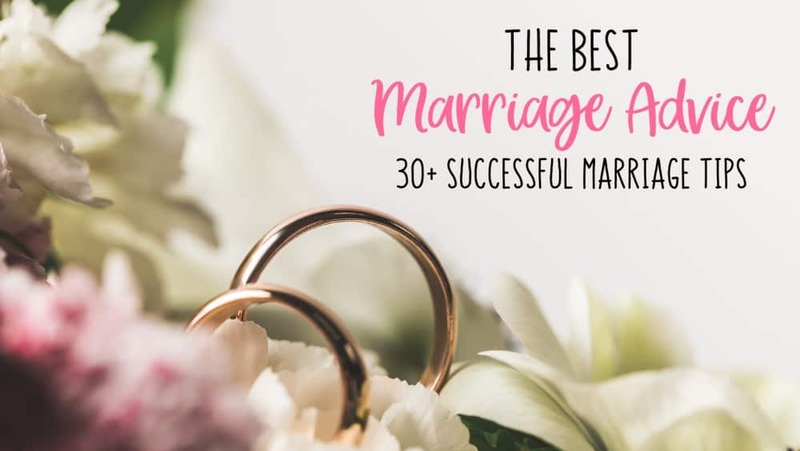 Check out my post here on The Best Marriage Advice Books. Is there anything that you both like? If so you should pursue doing that together so that you keep common interests. If there isn’t then find something. You could learn to love something your spouse loves or vice versa. Or you could even find something new to do together. But whatever it is, make sure to continue to do things together. It doesn’t have to be every week or every day. But you should find time to do something together that you both love. This helps you figure out how to stay married. 6. What’s the best marriage advice? Pray together. Growing your prayer life together can do wonders for your marriage. When you pray together you see the intimate sides of each other. You can seek and petition God for one another. It strengthens your faith and your bond at the same time. Keeping Christ at the center of your marriage is crucial to being successful. Do you have a married couple or two that you can watch? I’m not telling you to be a creep. But gleaning wisdom from other marriages can be very helpful. You can learn things that you would like to implement in your own marriage. And you can also see what you don’t want to do. Being around other married couples you can also ask for their advice and wisdom. If a couple has been married longer than you, chances are- they’ve been where you are and can help you get through it. Set aside time for each other- every day. It’s so easy to turn into roommates in marriage. But if you are intentional about making time together to talk, pray, do a devotional together or whatever it is that you like to do- then that won’t happen. My husband and I set aside time every night after our kids go to sleep to talk about our day, do our devotional and spend time together. It’s easy to get into a routine of sitting down with phones in hand and the TV on. You may be in the same room- but that’s not spending time together. Be intentional. I talk about this more in my free 5-Day Marriage Revival Course. It can be easy in marriage to start to point out everything your spouse is doing wrong. I mean, we are the ones who are with them most of the time and most likely know them best right? But your spouse is supposed to lean on you. If you are the one they love most in the world and they are only hearing negative things from you- how do you think that is impacting them? Encourage them. Speak life into them. Into their dreams, and ambitions. Tell them you appreciate them and what they do. And if you think they need to do more and it’s hard to find something nice to say read my post here on How to Get your Husband to do Whatever you want. If you’ve been breaking your spouse down with name calling, can I challenge you to build them back up? You married this person to spend the rest of your life with. Name calling only tears them down and makes them unmotivated to do anything. You cannot take those words and those names back. No matter how strong you think your spouse is- it effects them. If you’ve been name calling, purpose yourself to stop. Immediately. Take some time to sit down when you’re not angry and think of better responses than the ones you’re so used to using. Or choose to not say anything at all until you can get past that quick urge to spew out a mean name. Start off on the right foot and never allow this in your marriage. As a Christian, I don’t curse. And if you are following God you shouldn’t either. However, for those who do- those words seem to hold more weight in our vocabulary. They show how angry you are. And sometimes it can feel like it’s impossible to get the gravity of what you’re feeling across without using them. But curse words are sinful for good reason. You know how hurtful they can be and that’s why you use them. Your marriage should be filled with love. You should be speaking life into your marriage- not using horrible words towards each other. Sometimes, in the heat of our anger, a quick pause can save the day. Before you respond, pause and think. Pause and pray. Count down from 10 or do whatever you need to- to think of a better response. Could you imagine how many arguments and angry days could be saved be just a simple pause? I’m all about pausing. It is so beneficial in all relationships. Find out how I pause and use The S.E.L.A.H. Method here. 13. If your marriage is breaking- FIX IT. Great advice! And so important! Pinned to read through later, there’s a lot of great advice I don’t want to miss! Wow! This is an awesome list. I would even go so far as to say an exhaustive list. Jam-packed with great advice! All excellent tips, Elizabeth! Thank you for compiling this power-packed list!